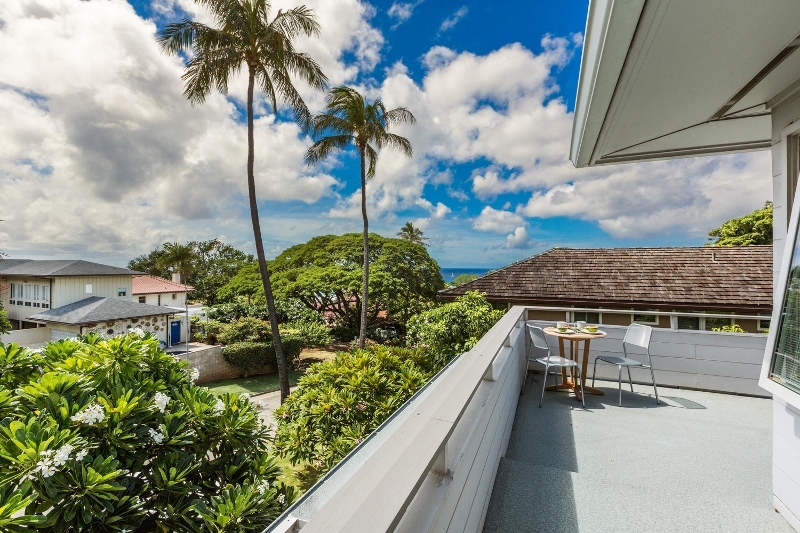 Makalei Hale – Luxury Vacation Homes, Inc. 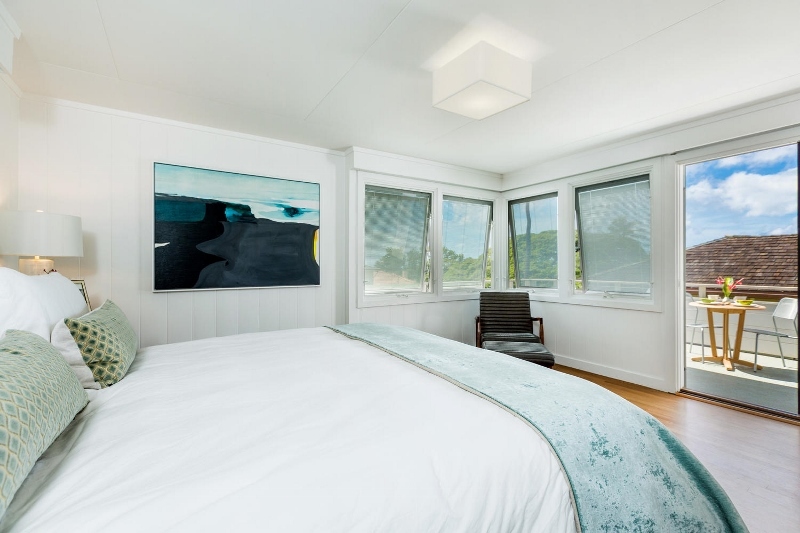 Welcome to your home away from home at Makalei Hale. 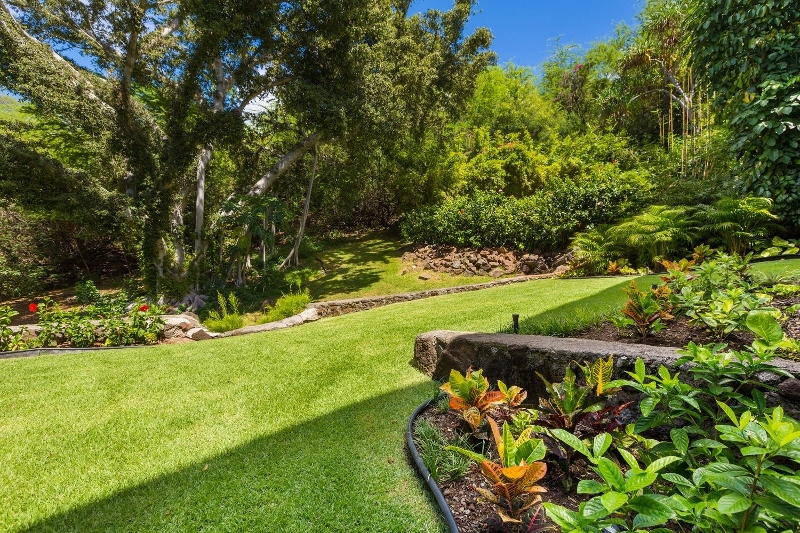 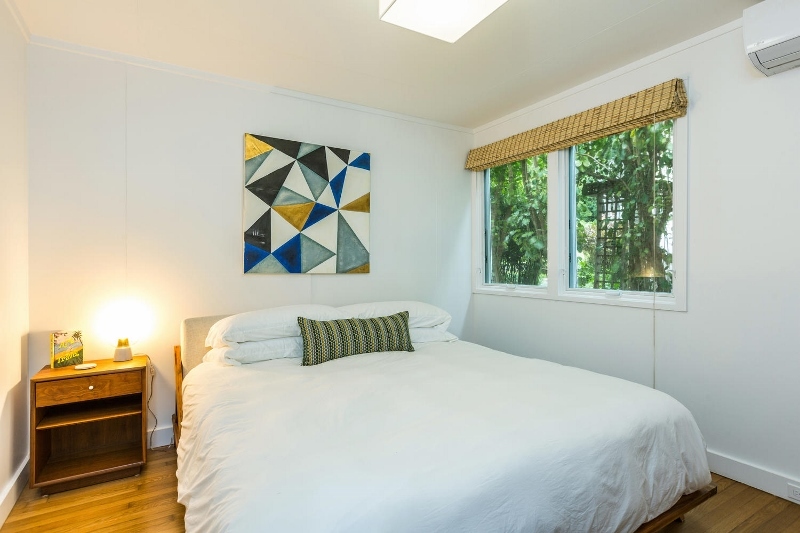 Situated on the slopes of Diamond Head, directly below Diamond Head’s Le’ahi Peak State Monument, the location simply couldn’t get any better if you are looking for a beautiful, private, and quiet retreat! 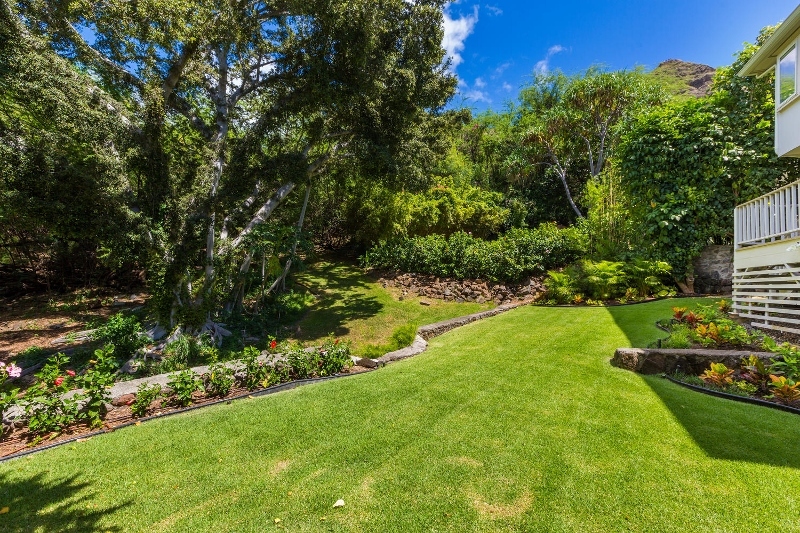 The home sits on an extremely exclusive and solitary street, and the back yard opens up to the slopes of Diamond Head state land with a tropical forest holding numerous species of island song birds. 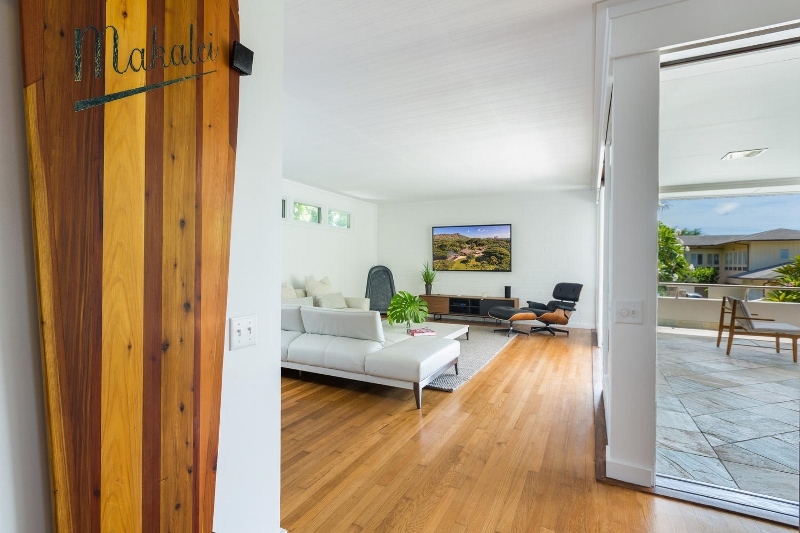 A quick walk will take you to Makalei Beach Park and Leahi Beach Park, practically known only to locals, with great swimming, surfing, and snorkeling. 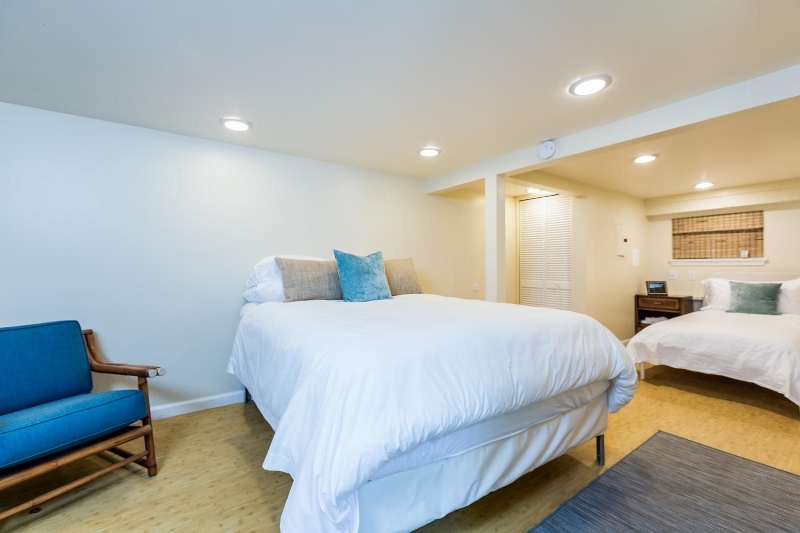 Within a few minutes, you can walk or bike to numerous restaurants and shops, Waikiki Beach, Kaimana Beach Park, shopping and dining on Kalakaua Avenue, the Honolulu Aquarium, Kapiolani Park, Kapiolani Bandstand, Waikiki Shell Amphitheater, the Honolulu Zoo , and the Ala Wai Golf Course. 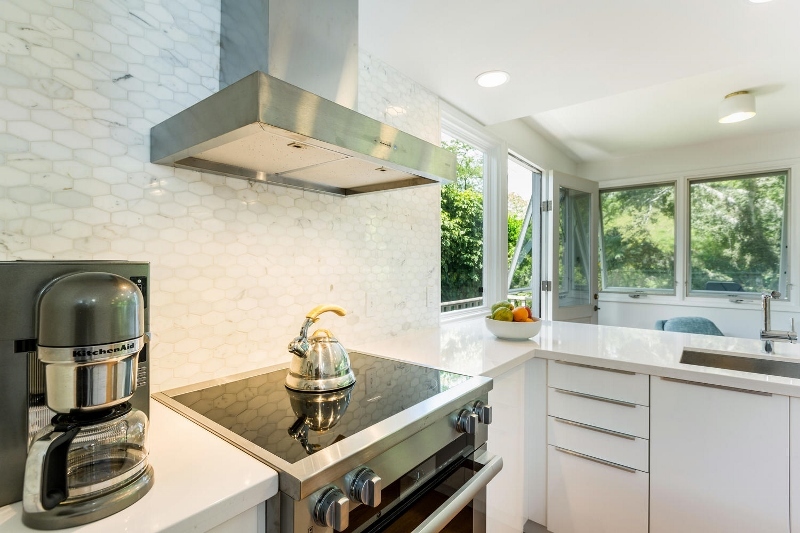 For grocery shopping, Safeway and Whole Foods are also conveniently just a 5-minute drive away. 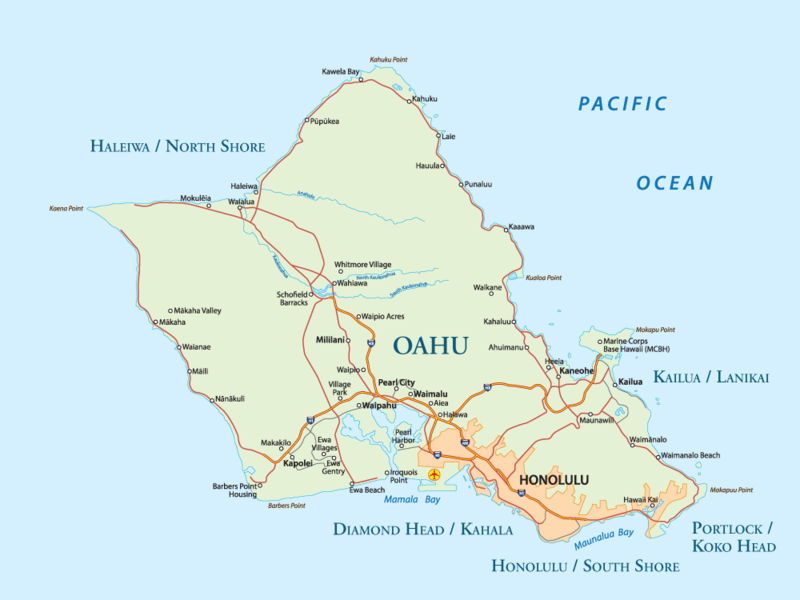 Honolulu international airport is about 20 minutes by car. 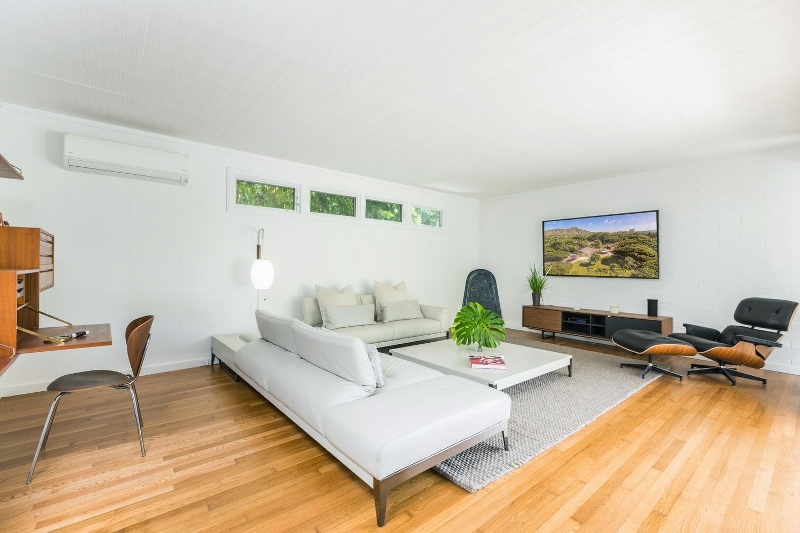 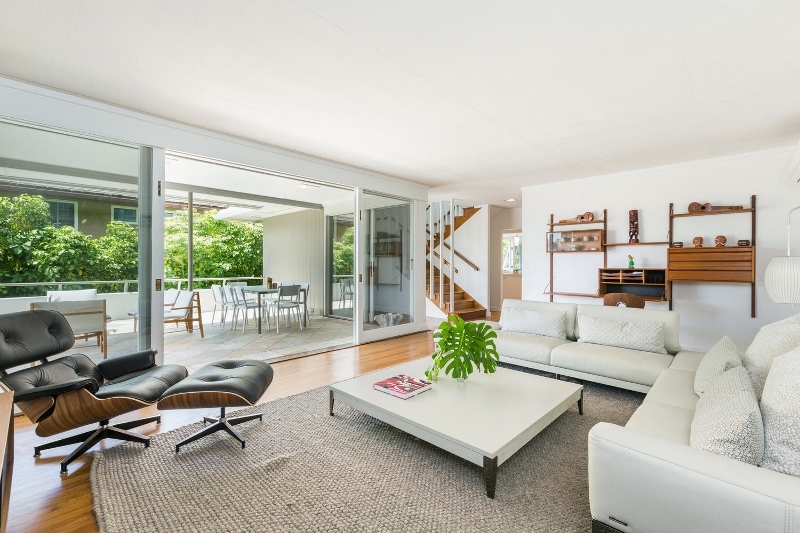 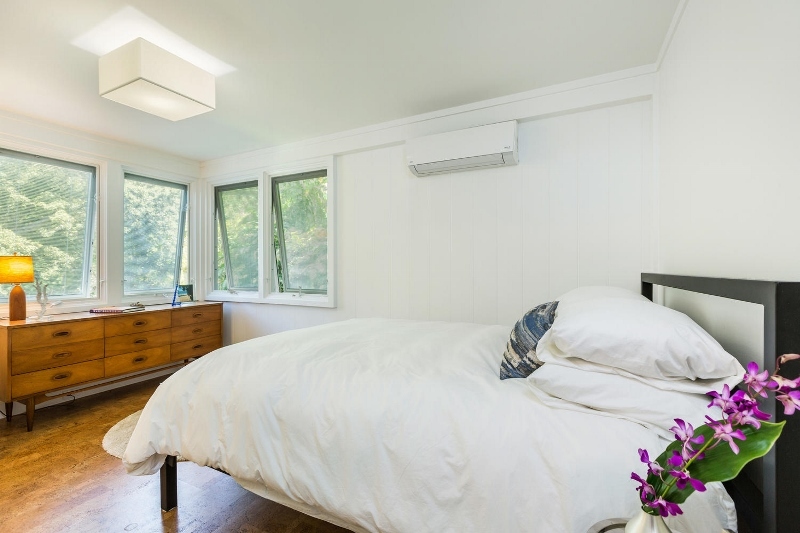 This mid-century-modern gem was recently renovated in 2016 and outfitted with only the finest designer furnishings. 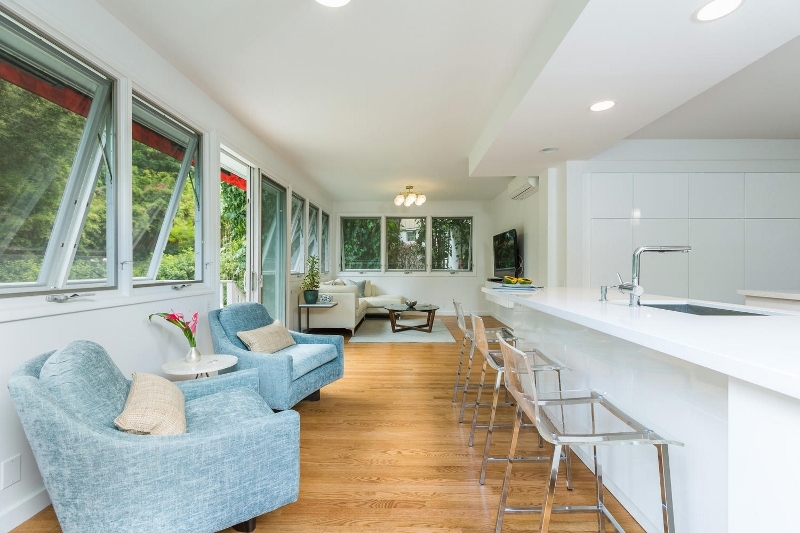 The living spaces offer furnishings from Roche Bobois, Mitchell Gold + Bob Williams, Room and Board, and CB2. 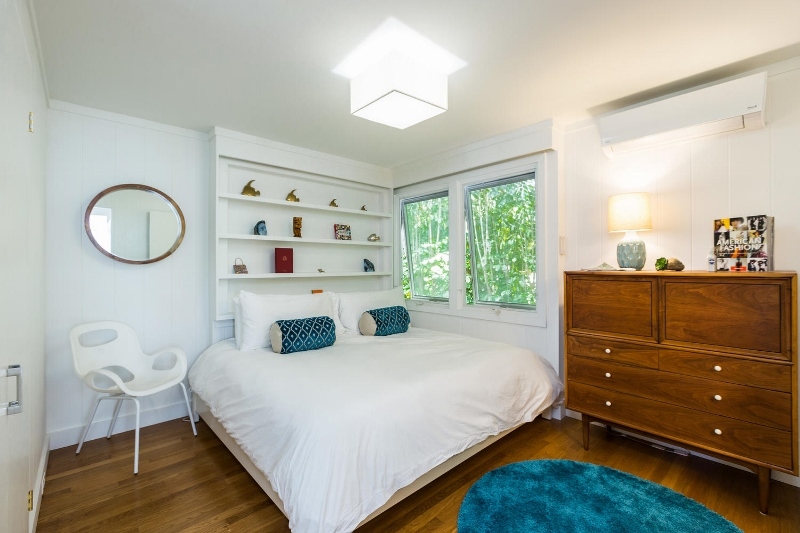 Original vintage pieces include a wall unit by Poul Cadovius, an original Eames chair, Broyhill Brasilia chest of drawers, and original Hermal Miller bedroom pieces. 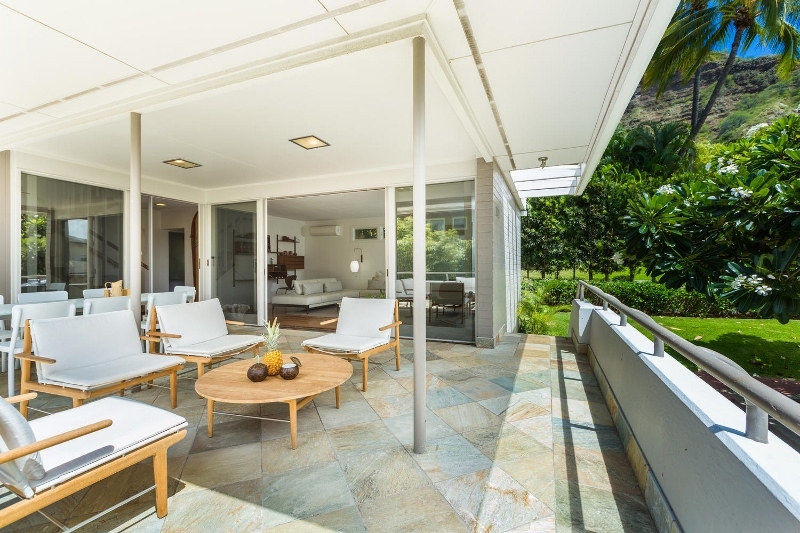 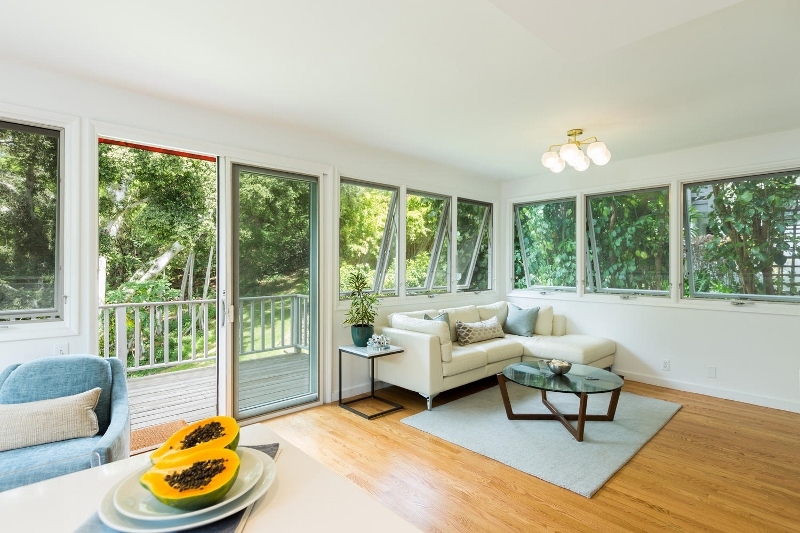 There is a spacious main lanai for morning coffee, evening dining, and everything in between. 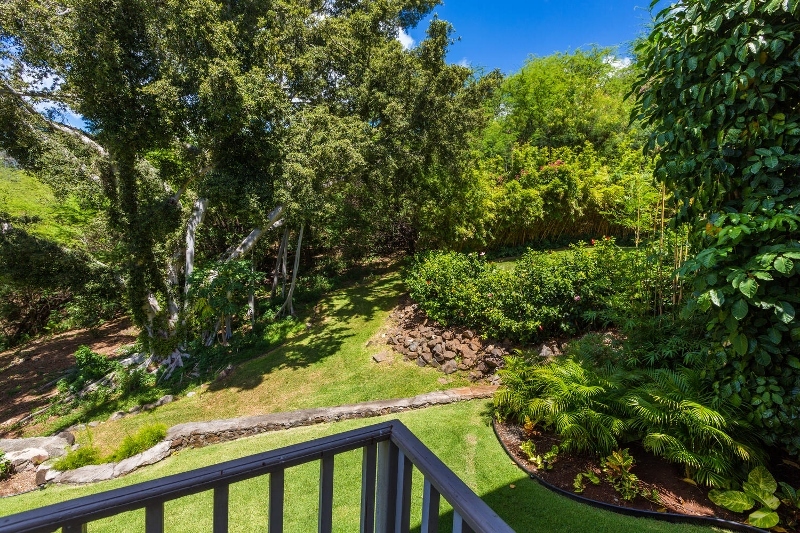 A rear deck overlooks an almost 100 year old banyan tree and tropical forest. 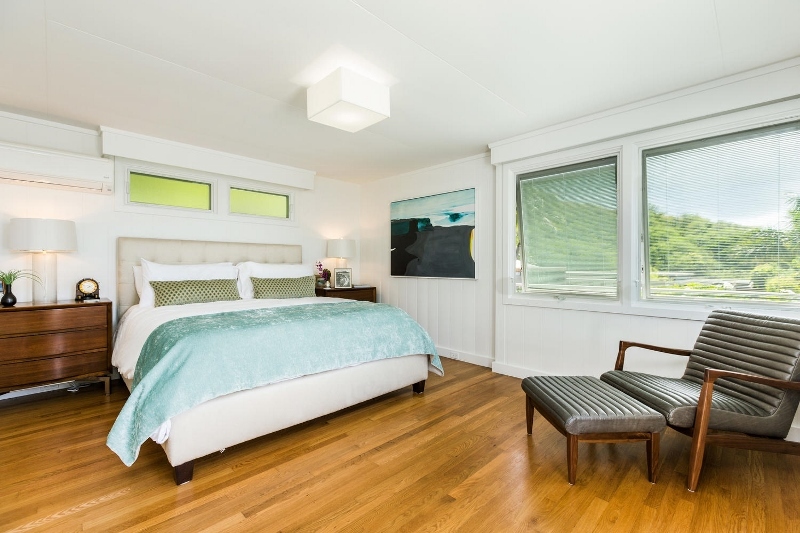 There is an additional, private lanai off the master bedroom to enjoy ocean views or nighttime stars. 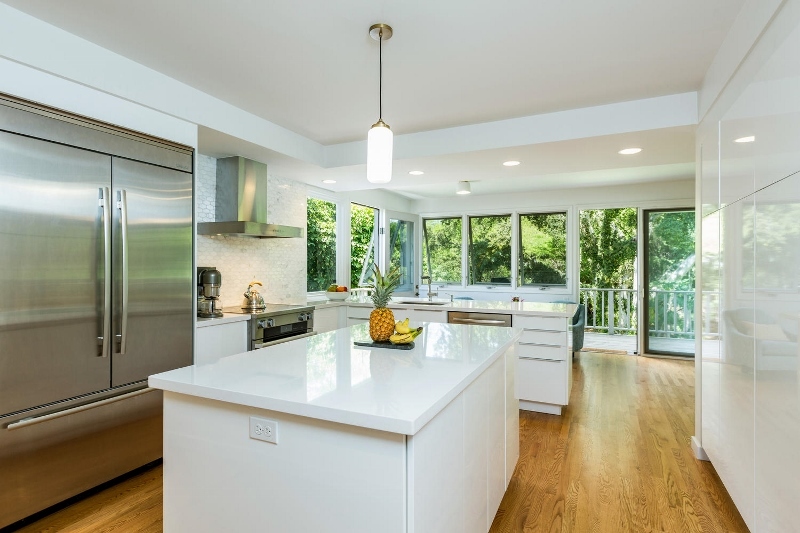 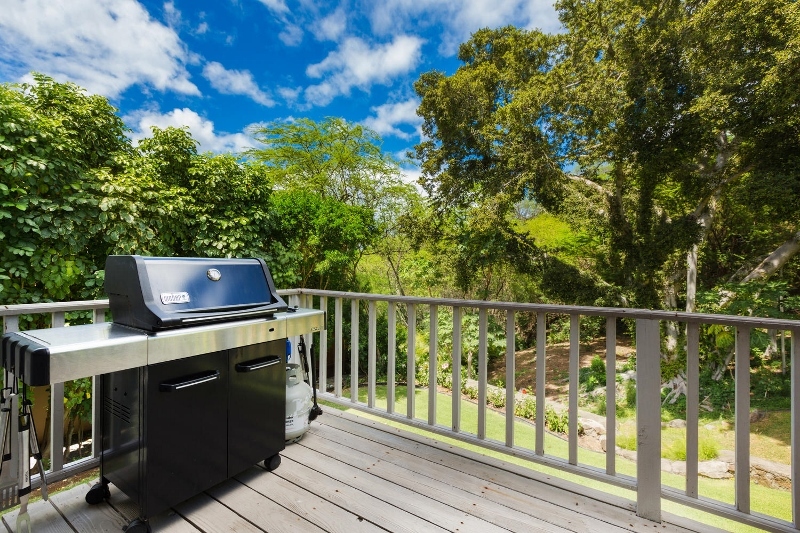 The new kitchen offers a state-of-the-art Miele induction stove and oven, as well as Jennair appliances, and there is a bar-b-que if you like cooking outdoors. 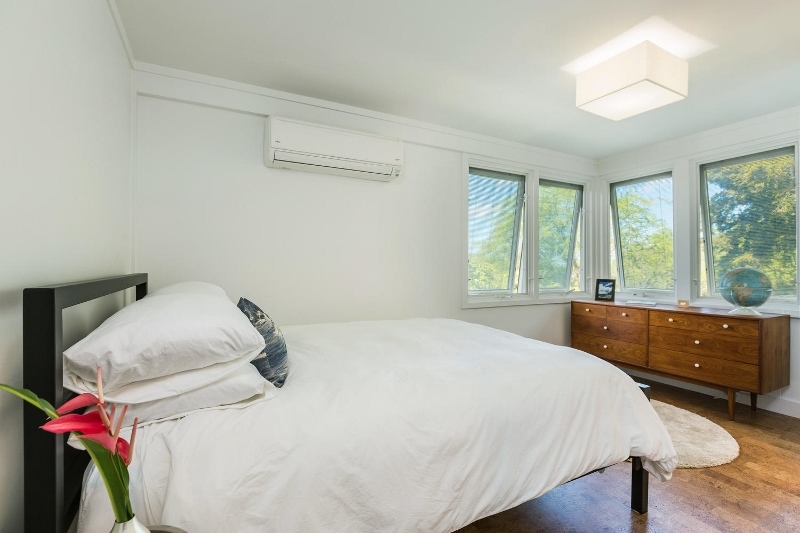 The home has two large living rooms, three large flat screen TVs, Apple TV, full Wi Fi and cable access, and Bluetooth speakers for your personal music. 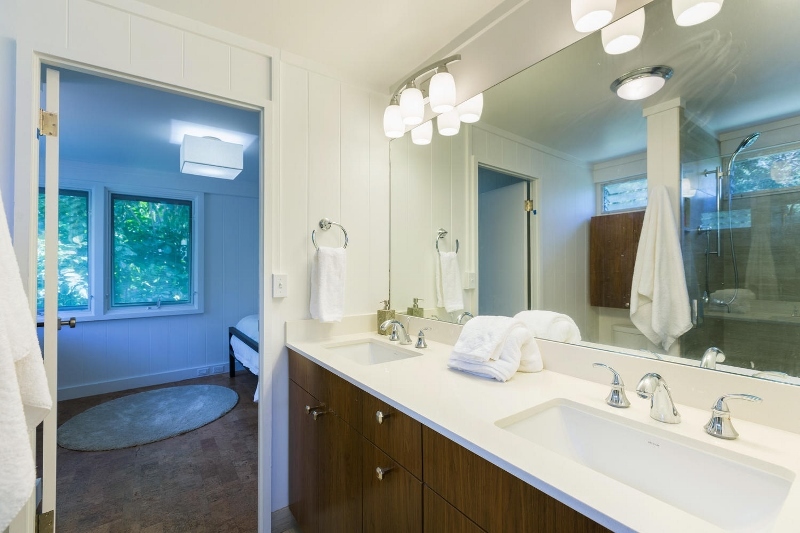 A full size new washer and dryer are ready for your use. 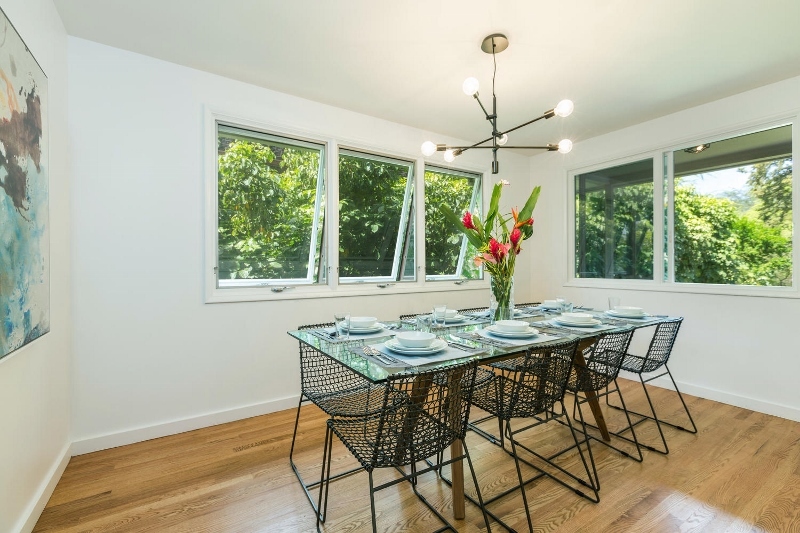 There is even a formal dining room gives you more than enough space to sprawl out with your ohana! 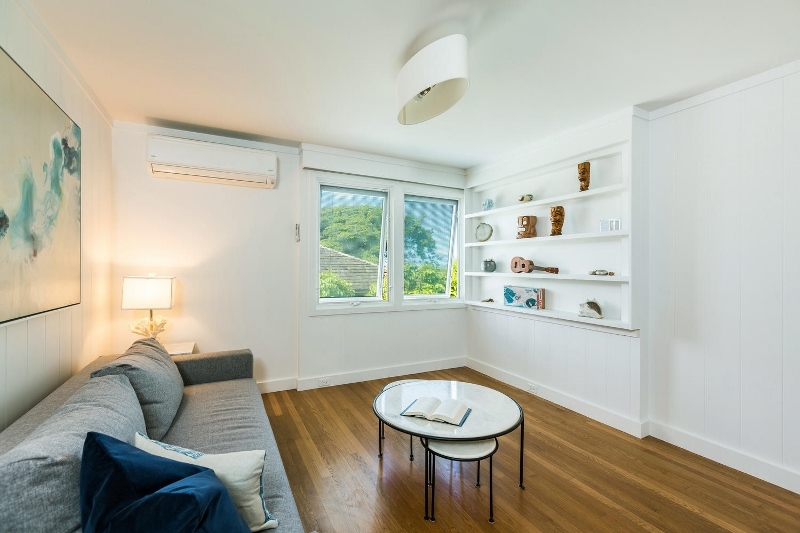 Most rooms are climate controlled with split unit A/C units, or large Pella windows can be opened to enjoy the tropical sea breeze. 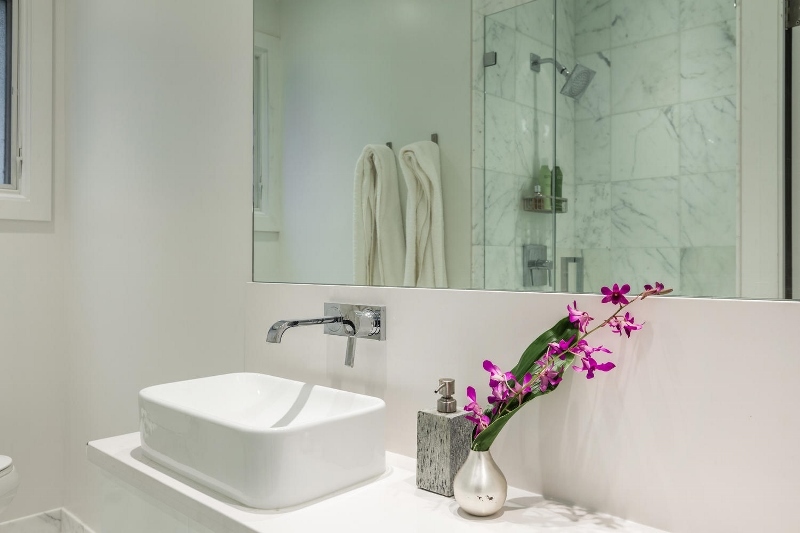 In the bedrooms and baths, you will be treated to Simmons Black Series mattresses, the same mattresses that grace the Ritz-Carlton Hotel Chain’s rooms. 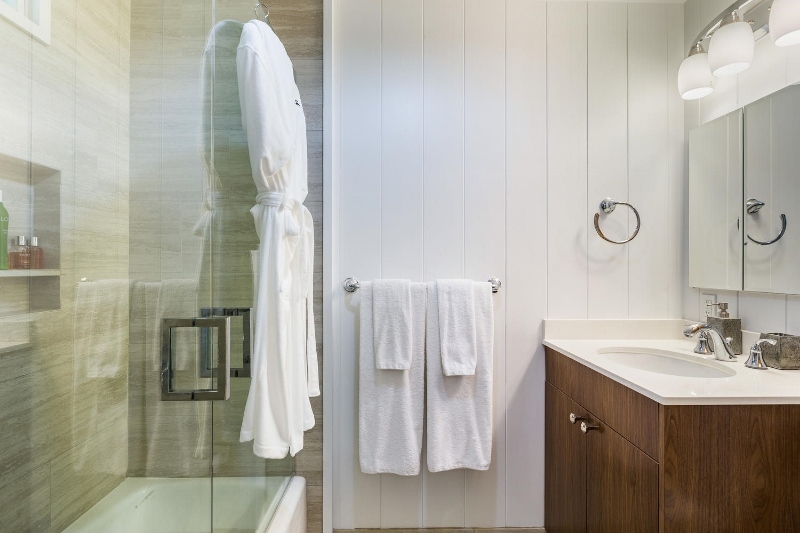 Each bed and bath boasts linens, duvets, towels, and wash cloths from the Luxury Hotel Collection of Frette. 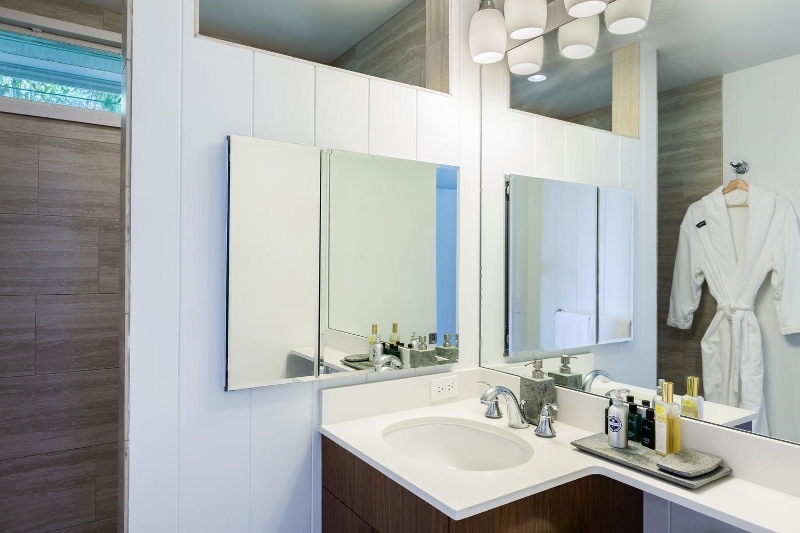 Hair care products are from the Loma Conscientious Organic Personal Care Products collection, and organic body soaps are offered by Les Notes de Lanvin. 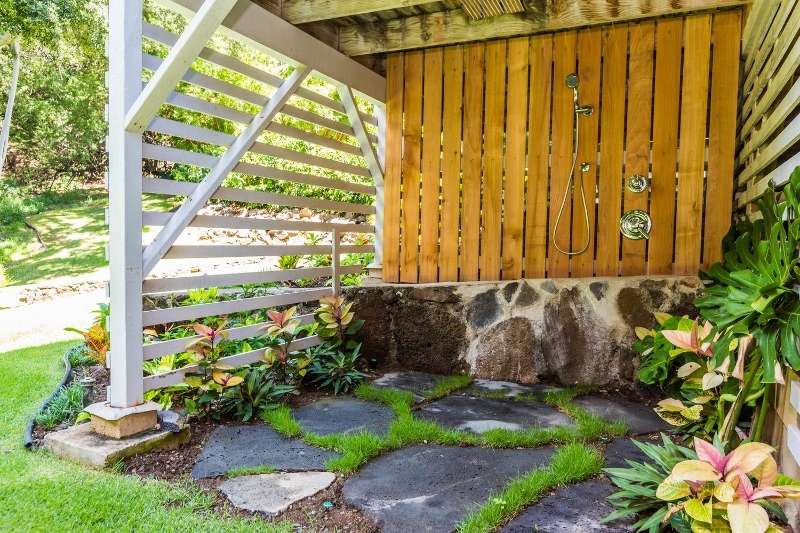 Enjoy the outdoor shower, surrounded by tropical plantings and lava rock flooring, with a huge Koehler rain shower head and shower wand. 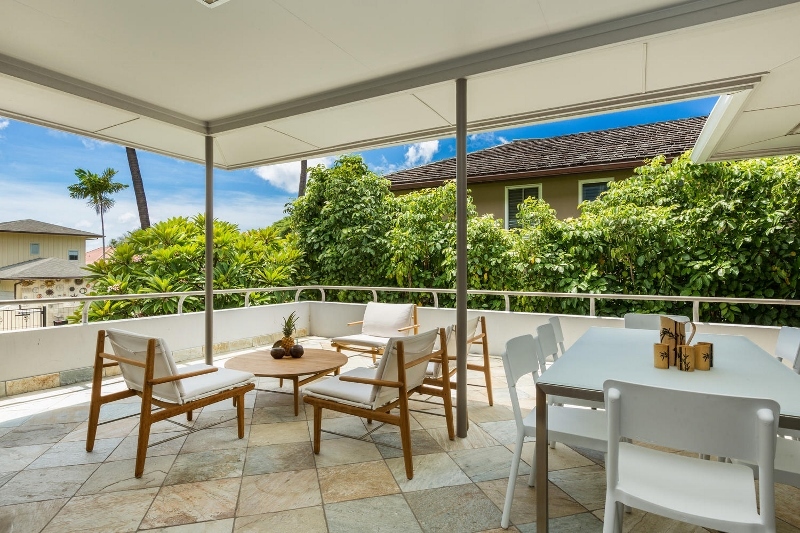 Come enjoy this property, located in arguably one of the best locations on the South Shore of Oahu, close enough to all the action of Waikiki and Honolulu, but secluded enough the ocean to hear the surf and the sounds of nature of a tropical forest.